The largest specialized food and beverage exhibition in Asia – SIAL CHINA 2016 – was held in Shanghai on 5-7 May 2016. The event is organized annually with four main sectors: food, meat, dairy products and wine, with the participation of about 3 000 exhibitors from 67 countries located in 11 halls and over 66 000 professional visits. The Executive Agency for Promotion of Small and Medium-Sized Enterprises (BSMEPA) organizes and partly finances Bulgarian national participation on a total exhibition area of 150 sq.m. with two booths at the Pavilion of Food and Wine Pavilion of the Shanghai New International Expo Center. Bulgarian goods enjoyed an increased interest from local merchants. 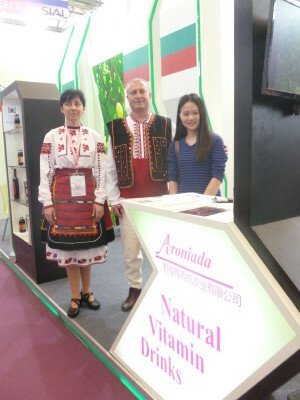 “Aroniada-agro” EOOD participated in the exhibition and presented bio-juice from aronia, bio-dried aronia and low-alcohol natural vitamin beverages from aronia. 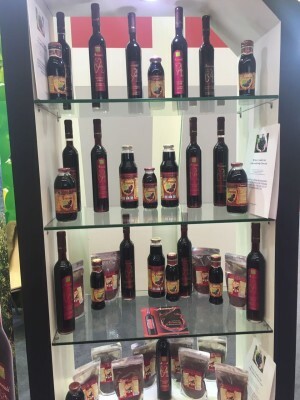 Our aronia products have enjoyed great interest from local and foreign companies. The presentation of our country was officially opened by the General Consul of Bulgaria in Shanghai – Mr. Dimitar Abadzhiev. The companies were visited by Rafael Jimenez, a consultant from the European Center for Small and Medium-Sized Enterprises in Beijing, who presented them the opportunities for Bulgarian companies to enter the Chinese market. 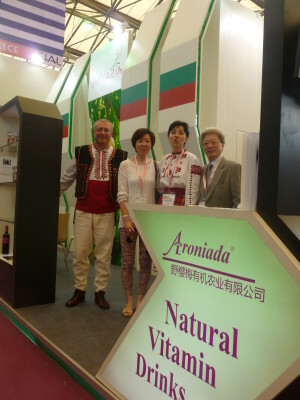 The Bulgarian stand was visited by the Ministers of agriculture of Belarusia, Poland and Hungary, who tasted the presented products.